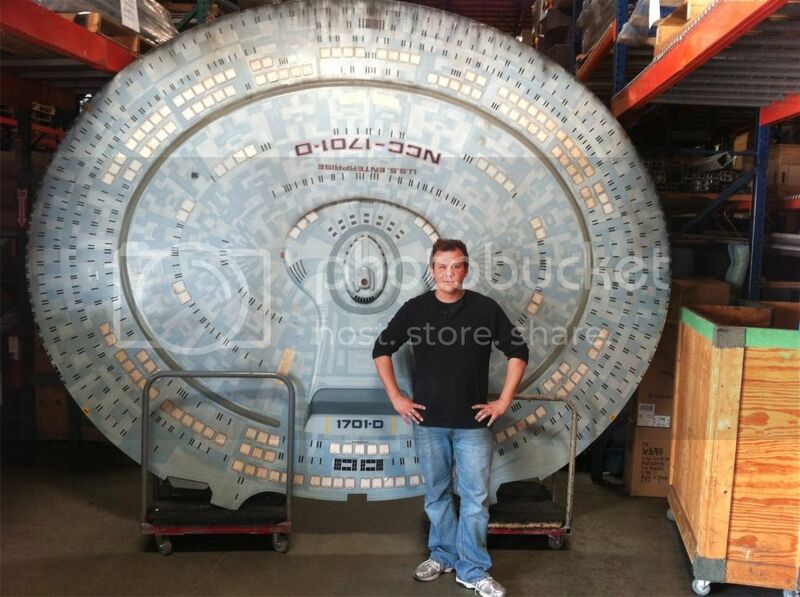 Propworx' Jarrod Hunt in front of the Enterprise "D" Saucer from "Generations"
There are a lot of lessons to be learned if you are going to collect screen used props & costumes. And telling the stories about collecting is one of my favorite things to do. I recently started working with CBS on the Star Trek archive, the collection of original props and costume spread through the Star Trek Exhibit and the Star Trek Experience. This meant going through 3 warehouses that had a small selection each of items, as well as cataloging what was on both of the Star Trek Exhibits that are on tour. Sometimes the coolest movie props aren't very collectible. Many people lament the destruction of sets from Star Trek when they are finished. But who has room to store a holodeck arch, or the engine core of the Enterprise NX-01? As sad as it is, th eonly thing you can do with these amazing set pieces is destroy them when teh sets are struck. of course items like the Captain's chair or the consoles, are kept, as they are small and easily stored. But big pieces are very difficult and expensive to store. Recently, CBS has begun to clear out storage units where parts of the STar Trek Exhibit have been stored. There were storage facilities in Anaheim and Burbank CA that housed different assets from the various TV shows and movies as well as display cases, wall units and more. So much of it was left over from the big Long Beach show that kicked off the Star Trek Exhibit a few years ago. From these storage facilities we pulled such things as the Nebula Class filmimg miniature, the Grand Nagus Bust featured in Deep Space Nine and more. These items are now safely stored in the temperature controlled facility of Propworx. Some items were just too big and not worth storing. The forced perspective filming miniature of the Golden Gate Bridge from Star Trek IV for example was in poor shape, and frankly, not very interesting, so it was disposed of. No collector would have the space to store such a piece nor would they be willing to pay what it cost to ship as it was in a huge crate. It simply wasn't worth the effort. But one piece that we are trying to find a home for is the large scale saucer section of the Enterprise "D" from the crash landing scene on Veridian III in Star Trek: Generations. This is a huge piece, about 12' high by 15' wide. It is heavily featured in the featurettes on the Generations Blu Ray and DVD. Now, on the face of it, you would think this, being the biggest filming miniature ever used in Star Trek, would be an easy piece to find a home for. But this gets to the "Law of Big Props". Basically the law says that "The bigger the prop, the harder it is to sell". And this is one BIG prop. So for the past month, we have been trying to find a home for this piece. It needs some restoration, but is incredibly cool. If you know a place that might want to make a home for it ( a museum would be a great place), please email me alec at propworx dot com. 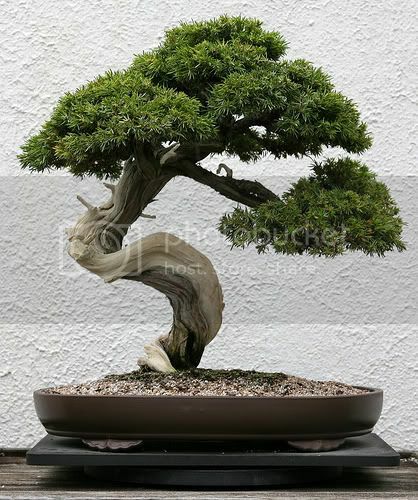 A collection is like taking care of a Bonsai Tree. It grows and you trim it, it grows and you trim it again. You are always looking for the perfect shape, and that shape changes over time. That is how you need to think of your collection. What is the goal you are shooting for? Will a new purchase get you closer to that goal? What do you need to sell in your collection to get that new piece? Recently I sold almost every piece of a certain aspect of my collection. It just wasn't growing the way I wanted, and the key pieces probably weren't going to surface or were too expensive. So I decided to do away with that "branch" of my collection. Think about your collection, and see if you are growing it with a goal in mind. And remember, it will never be "perfect".